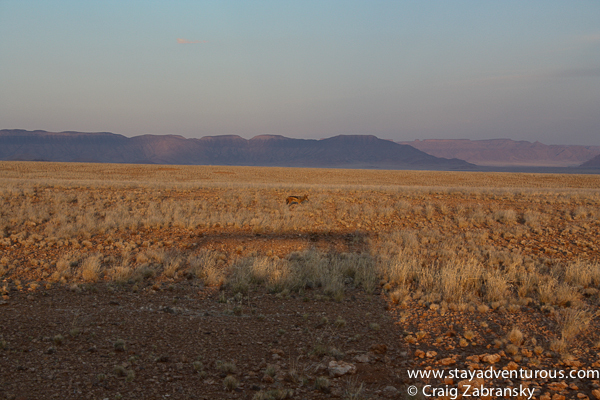 After the day spent hiking the insanely incredible red sand dunes of Sossusvlei, I returned to the lodge. 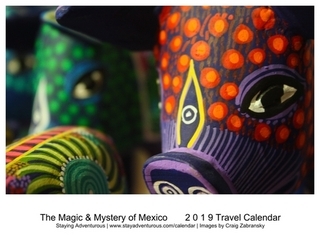 Next up – a special sunset adventure. 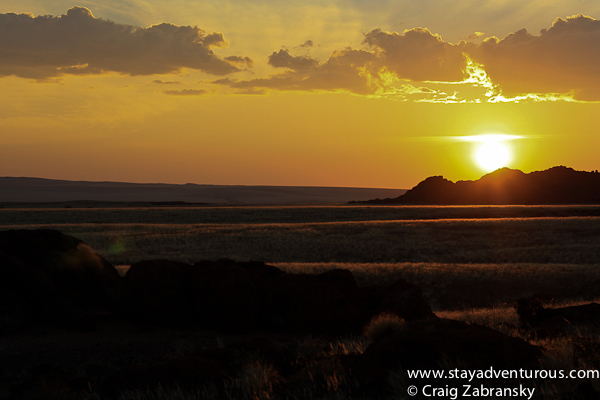 The Sossusvlei Lodge offered an afternoon adventure tour designed to catch a glimpse of the setting sun. I signed up. 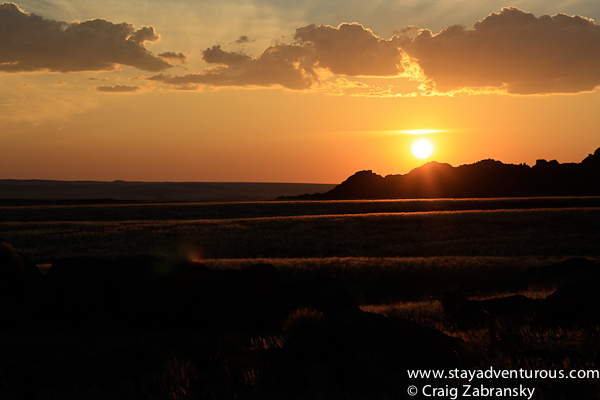 And after the prior day’s Namibian sunset in Sossusvlei, I was eager for another sunset. We boarded the all terrain vehicle, and five of us with a guide headed out into the vast wilderness. We drove across grasslands, spotted wildlife, enjoyed our own shadows, and eventually hiked some rocky terrain to climb up to the perfect vista. Now we waited as the sun edged closer to the distant horizon. Our guide placed a few beers among the rocks to allow the five of us to toast to the magical moment as he sang local poetic songs in his native click language. As the sun inched closer the celebration turned to stillness. We all gazed in silence. The bursts of brilliant light illuminated the sky and caused a glow across the fields. A golden amber wave rolled across the terrain and into our hearts. We all came to Africa for a life changing journey. We found it everywhere including at this sunset. 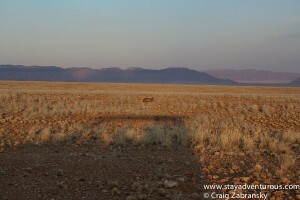 this post is part of the Namibia November series. Wow both pictures are gorgeous. I love the deep colors of the first one and then the light yellows of the second. I don’t know how you do it , but you always take the most amazing sunset photos ever. Make me wish I was there gaze at the sunset. A beautiful sunset made even more so by the company who shared it! What a very memorable moment. A place in time I will never forget. Just gorgeous! What a place to see the sunset. @Shanna, thanks, I don’t often post two images, but I really loved how the light and colors shifted across the fields, I needed two this week. @Sarah, thank you. I appreciate such a comment from quality photographer like yourself. I do chase the sunset at times, but I have been blessed with so many wonderful ones… like this one.